Napoleon Hill summed up his philosophy of success in Think and Grow Rich!, one of the bestselling inspirational business books ever. A recent USA Today survey of business leaders named it one of the five most influential books in its field, more than 40 years after it was first published. Now, in Napoleon Hill’s Keys to Success, his broadly outlined principles are expanded in detail for the first time, with concrete advice on their use and implementation. 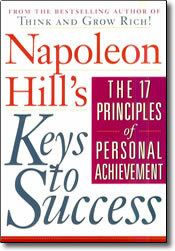 Compiled from Hill’s teaching materials, lectures, and articles, Napoleon Hill’s Keys to Success provides mental exercises, self-analysis techniques, powerful encouragement, and straightforward advice to anyone seeking personal and financial improvement. In addition to Hill’s many personal true-life examples of the principles in action, there are also contemporary illustrations featuring dynamos like Bill Gates, Peter Lynch, and Donna Karan. No other Napoleon Hill book has addressed these 17 principles so completely and in such precise detail. For the millions of loyal Napoleon Hill fans and for those who discover him each year, Napoleon Hill’s Keys to Success promises to be a valuable and important guide on the road to riches.